For far too long, Australian evangelicals have proclaimed a gospel loaded with the cultural baggage of suburbia: personal security, individual salvation and an other-worldly focus. Is this message really a set of timeless truths with universal application? Or have we injected Jesus? message with our own values? 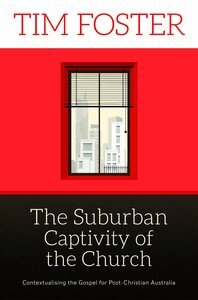 The Suburban Captivity of the Church calls us to venture beyond the picket fence and engage with the cultural narratives around us, to see how God's big story meets them with both challenge and hope. Whether we are reaching a new culture, or trying to bring the gospel to our own in a more biblically faithful way, this book will equip us for the task. About "Suburban Captivity of the Church: The Contextualising the Gospel For Post-Christian Australia"
Tim Foster has served as an ordained Anglican minister in both suburban and urban contexts. He has also worked as a youth minister and led the Training Division at Anglican Youthworks in Sydney. Tim later founded Youthworks College. His DMin (Fuller Seminary) focused on mission and church in the post-Christendom context. Tim is currently Vice-Principal of Ridley College, Melbourne, where he teaches Practical Ministry and New Testament. He is married to Alison, and they have three children.